Seoul is indisputably one of the trend-setting cities, exerting influence on cosmetics, fashion and even food across Asia. Walking on the streets of Seoul, you could quickly notice the hottest and newest trend. 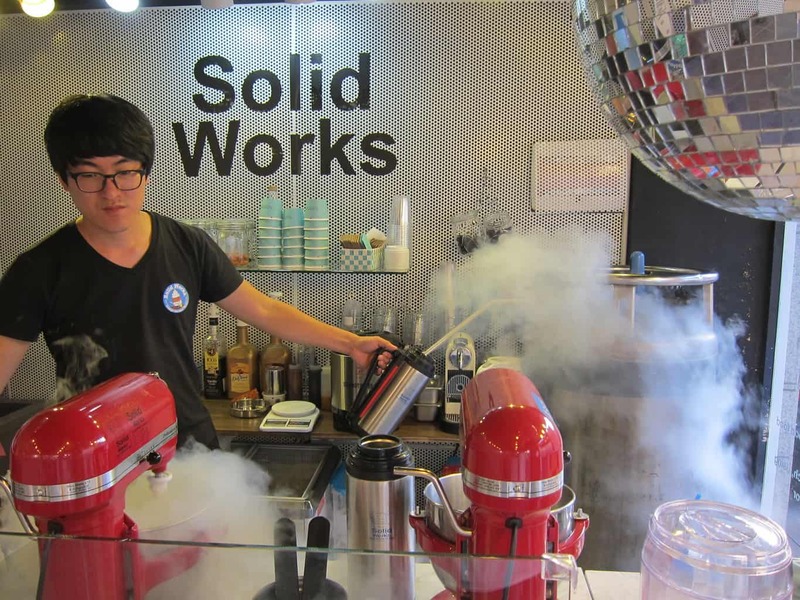 As we roaming around Ewha shopping district, we stumbled across a chic tiny shop, specializing in instant ice cream made with liquid nitrogen. Imagine yourself walking into a science lab, watching crazy scientists conducting experiments. The only difference being the end product is edible. That’s the concept at Solid Works. Well, minus the white lab coat. As soon as we ordered, the staff was quickly put to work. Seeing all the ingredients being mixed at the handstand mixer and the smoke oozing out was totally fascinating! What’s going on there? Don’t worry. 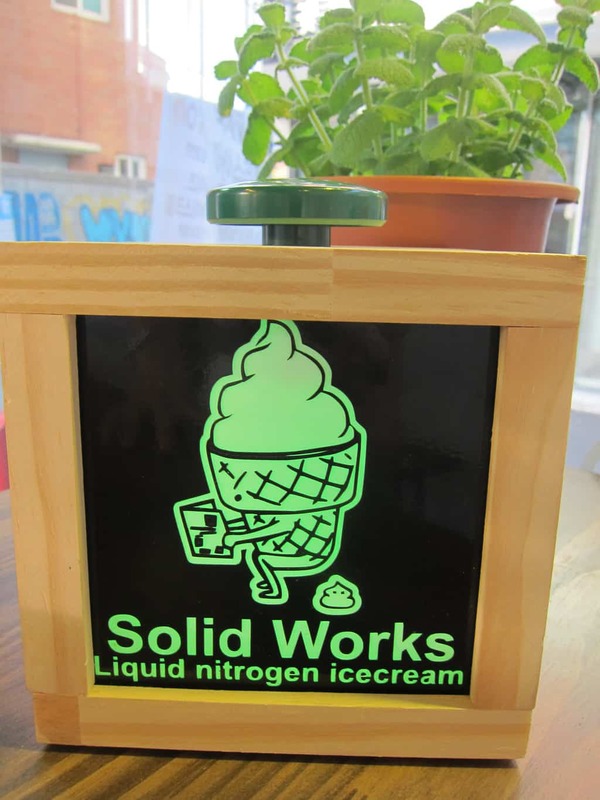 It’s just the chemical reaction while liquid nitrogen was being added to freeze the ice cream at -196 degrees Celsius. The reason for doing that is to keep the ice cream silky. After a quick 10 minutes, our mango ice cream (4,000 won) was ready! Tah dah! 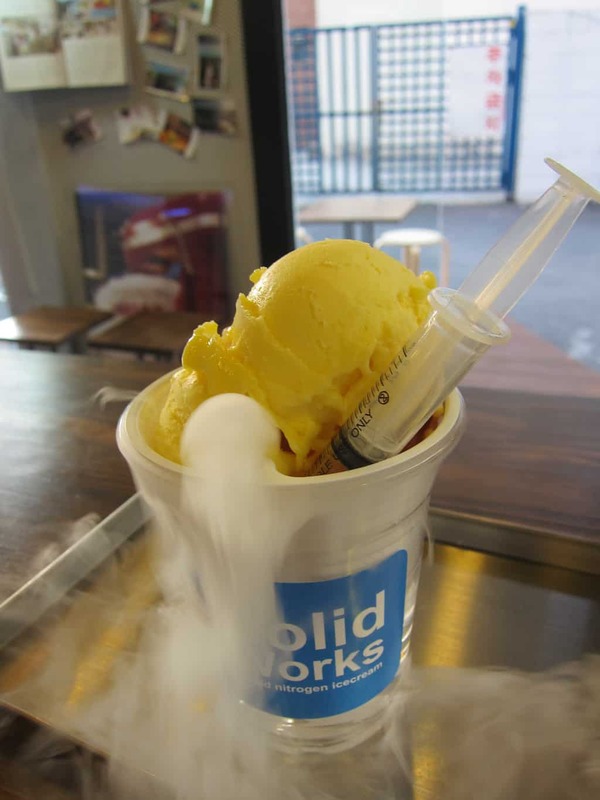 A syringe filled with mango syrup was then served as topping, along with a cup of bubbling dry ice attached at the bottom to give it a cool visual presentation. 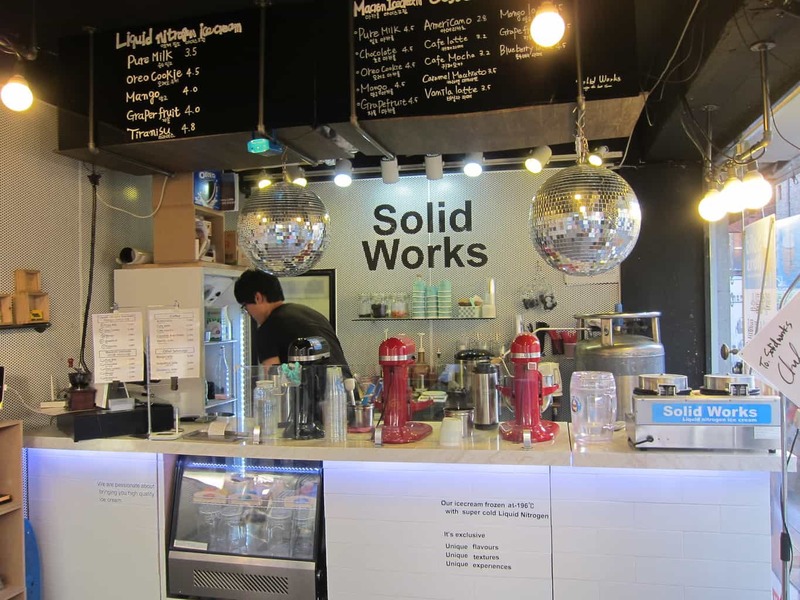 Besides mango, 4 other flavours are currently being sold at Solid Works, including pure milk (3,500 won), oreo cookie (4,500 won), grapefruit (4,000 won) and tiramisu (4,800 won). 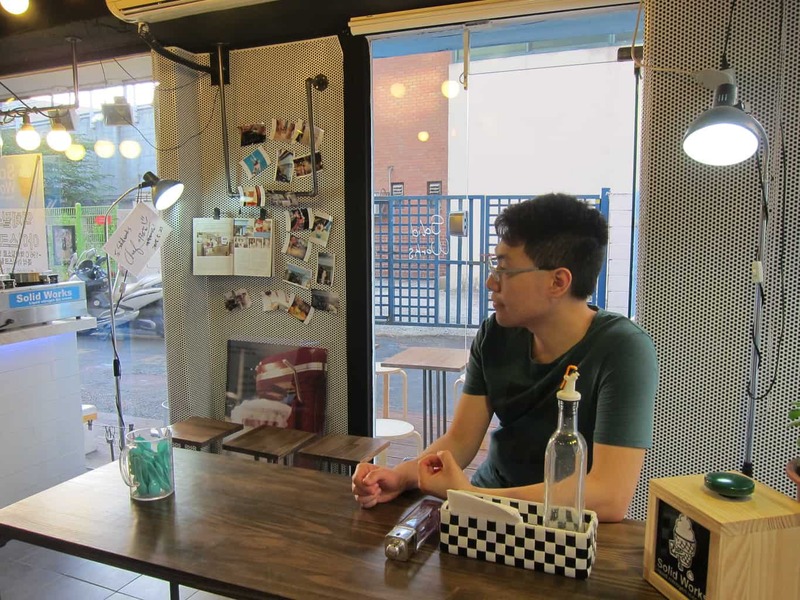 Now you know the newest dessert trend in Seoul. Don’t forget to stop by next time! As it is getting more and more popular, different chains with the same concept continue to open up. 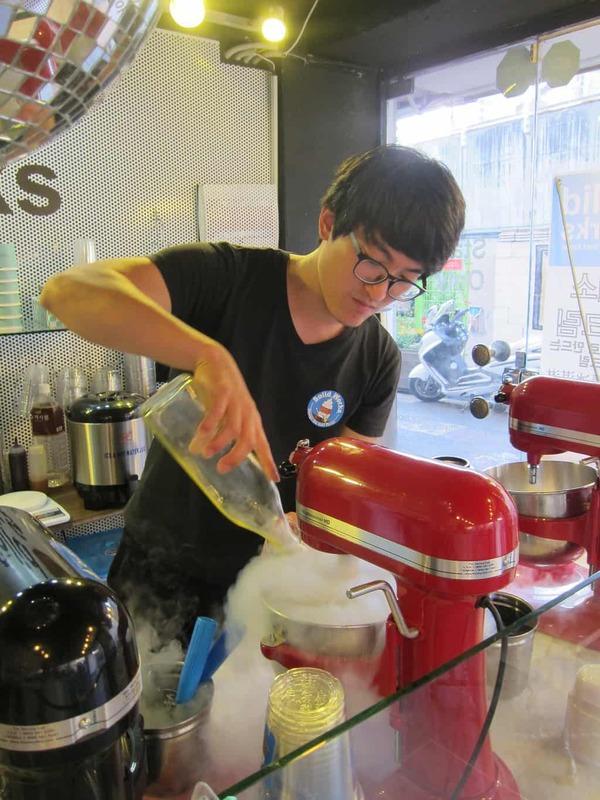 As long as you are in busy shopping districts in Seoul or Busan, you can always find liquid nitrogen ice cream shops. Just keep your eyes open!